KENEMA, Sierra Leone, Jul 12 2014 (IPS) - Adikali Kamara is a 36-year-old student nurse working in the government hospital in Kenema, a sprawling town on the fringe of the Sierra Leone’s Gola tropical rain forest. On June 19, he began feeling unwell, complaining of fever and a headache, and went to a chemist near where he lived to buy anti-malaria drugs and antibiotics to treat typhoid fever. “I thought that my symptoms indicated either malaria or typhoid because these are the most common ailments suffered by everybody here,” said Kamara. However his condition did not change and two days later he decided to seek proper treatment at the hospital. That was when the doctors discovered he was suffering from Ebola, a disease that causes fever, vomiting, bleeding and diarrhoea and kills up to 90 percent of those infected. Kamara was admitted immediately and just seven days later he was discharged after receiving supportive treatment. Kamara is one the fortunate 51 persons in Sierra Leone who have survived the current Ebola scourge that is also ravaging two other West African neighbours – Guinea and Liberia. So far, 99 have died in Sierra Leone and a further 315 men, women and children have tested positive. 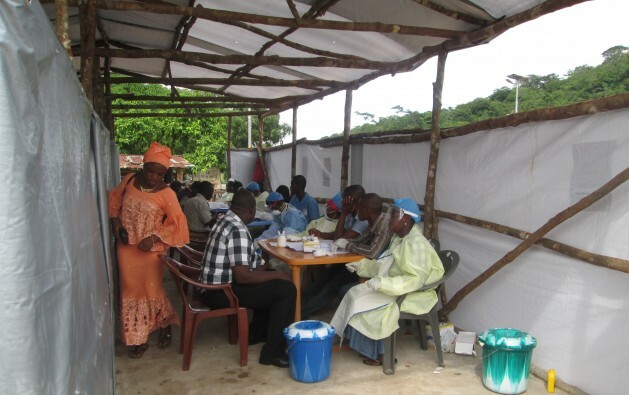 The Public Health Education Officer for Sierra Leone’s Eastern Province, Michael Vandi, who is based in the Kenema hospital which houses the country’s only Supportive Treatment Centre and testing laboratory for Ebola, said that the country is far from winning the fight against the disease, blaming people’s fear and denial of the disease. According to Vandi, people are accusing doctors of administering lethal injections to the Ebola patients or removing vital organs for sale in European markets. He said that some even claim that people are being deliberately infected with the virus to reduce the population. As a result, doctors and nurses in the hospitals have been attacked and many nurses are not wearing their uniforms on the way to work for fear of being attacked in the streets. The Senior Human Rights Officer who heads the Human Rights Commission’s Office in the Eastern Province, Hassan Yarjah, blames the government’s Ebola awareness raising strategy for fanning mistrust and disbelief among people. He pointed out that the eastern part of the country, in which almost all cases of Ebola have so far been identified, is an opposition stronghold. “What the central government is doing, which I think is wrong, is sending people to these communities that the people cannot identify with; they are parliamentarians, they are ministers, they are executives from the ruling All People’s Congress party and this is a country where everything is polarised,” he said. “I think government should use the local structures, like the paramount chiefs, the medical personnel on the ground, and the local councils,” Yarjah told IPS. Meanwhile, the government has announced a ban on regular trade fairs in Kailahun, one of the districts in Eastern Province worst hit by Ebola. There has also been an executive order for placing medical personnel at a number of checkpoints on roads from the Eastern Province to check people for Ebola-related symptoms. Whatever the misgivings, misconceptions and accusations, the virus is thriving, in part due to dysfunctional medical systems and weak disaster management structures in Sierra Leone and its neighbours. At the beginning of July, the World Health Organization (WHO) held an emergency meeting in Accra, Ghana, with health ministers from 12 West African countries to discuss and propose suggestions to combat the outbreak of Ebola virus that has hit the three West African countries. The ministers adopted a common inter-country strategy calling for accelerated response to the Ebola outbreak in West Africa. The strategy stressed the need for regional, sub-regional and national leadership, coordinated actions by all stakeholders, enhanced cross border collaboration and the involvement of communities. The problem is that while Ebola may be a killer, a potentially greater threat to Sierra Leoneans and West Africans in general lies in less spectacular diseases. During the current outbreak of Ebola, other diseases are quietly taking their toll. Malaria is still rampant, and there is concern that cholera, which usually attacks during this period of the rains, will resurface to claim more lives.